Probabilistic safety assessment methods are used to calculate nuclear power plant durability and resource lifetime. 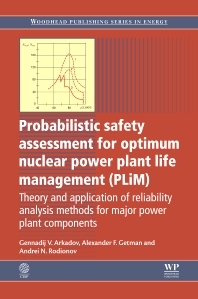 Successful calculation of the reliability and ageing of components is critical for forecasting safety and directing preventative maintenance, and Probabilistic safety assessment for optimum nuclear power plant life management provides a comprehensive review of the theory and application of these methods. Part one reviews probabilistic methods for predicting the reliability of equipment. Following an introduction to key terminology, concepts and definitions, formal-statistical and various physico–statistical approaches are discussed. Approaches based on the use of defect-free models are considered, along with those using binomial distribution and models based on the residual defectiveness of structural materials. The practical applications of probabilistic methods for strength reliability are subsequently explored in part two. Probabilistic methods for increasing the reliability and safety of nuclear power plant components are investigated, as are the use of such methods for optimising non-destructive tests, hydraulic tests, technical certification and planned-preventative maintenance. Finally, the book concludes with information on the use of probabilistic methods in ensuring leak tightness of nuclear power plant steam generator heat exchanger pipes. With its distinguished authors, Probabilistic safety assessment for optimum nuclear power plant life management is a valuable reference for all nuclear plant designers, operators, nuclear safety engineers and managers, as well as academics and researchers in this field. Nuclear plant designers, operators, nuclear safety engineers and managers, academics and researchers in this field. Dr Gennadij V. Arkadov is based at the All-Russia Scientific Research Institute for Nuclear Power Plants Operation (VNIIAES), Russia. Prof. Alexander F. Getman is based at the All-Russia Scientific Research Institute for Nuclear Power Plants Operation (VNIIAES), Russia. Dr Andrei N. Rodionov is based at the Institute for Radiological Protection and Nuclear Safety (IRSN), France.